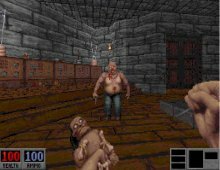 Arguably the best game ever made with Ken Silverman's Build 3D engine (the engine behind Duke Nukem 3D), Blood is an excellent, atmospheric, and highly replayable first-person shooter that distinguishes itself from other DOOM clones with a great (albeit campy) sense of humor, memorable monsters, weapons, and sound effects - and of course a ton of blood. First, it must be said that if you are offended by excessive gore and violence, don't play this game. True to its name, there is a lot of gore in Blood: fountains of blood spurt from everything you kill, decaying bodies explode in gory chunks when you hit them, and you will often find recognizable body parts and still-breathing humans crucified on walls. The game is very over-the-top and intentionally so. The result is that Blood is more silly and funny than scary - a "B-movie" kind of game. But as far as campy games go, Blood is by far one of the best and most entertaining. It makes up for any potential offensiveness with wit and charm - but only if you are willing to lower your sensitivity threshold. Now that we get the caveat out of the way, let's talk about the game proper. Fortunately, the gory violence is not all that Blood has to offer. While the graphics in Blood is inferior to other DOOM clones (they look too blurry and the palette too dull for me), the environment is wonderfully alive. Thanks to the Build engine, the sheer amount of actions you can do in this game is amazing. You can blow huge parts of the environment up - even destroy an entire train if you want. In addition to plenty of undead monsters, you will meet a number of memorable and funny characters including JoJo the Idiot Boy, as well as original monsters such as severed hands. Blood also has excellent sound effects that more than make up for pixelated graphics: from the zombies' mumbles, to disembodied voices from the past, to your character, Caleb, quoting cool one-liners from Evil Dead and Shakespeare (he beats Duke Nukem's quips hands-down in my opinion), sounds add a great atmosphere to the game. As would be even more evident in Monolith's later games (No One Lives Forever for instance), the level design in Blood is very clever, and is clearly something the designers put a lot of thought in. There are many thin walls you can blow open, rotating rooms, and fun and memorable "theme" levels (an abandoned ship, the carnival, and a moving train are my favorites). The gameplay is the same "find key X to open door Y to find key Z that opens door A that contains key..." of most DOOM clones, mixed with a fair amount of switch pulling. Still, the fun level design, the sense of humor in everything, and the number of secrets you can discover make Blood very entertaining and eminently replayable. Equally innovative is the design of weapons and various power-ups. Most of your weapons are very unique, original, and just plain fun to use. While you start the game with a "standard" pitchfork, you will soon collect an impressive array of cool weapons, including a voodoo doll, a Tommy gun, the aerosol can, and the life leech. Although the game suffered from a lot of bugs in the original release, they're minor ones that did not detract from the excellent gameplay. The full multiplayer support and map/level editor round off this superlative game. If you love 3D shooters, can at least tolerate campy humor, and are not offended by 'cheesy' gore and violence, Blood is one of the best games you will ever play. If you like the game, check out its excellent (but less fun) sequel called Blood 2 also on this site. Two thumbs up, way up!